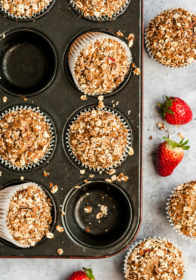 These easy strawberry banana muffins with oat streusel topping make a great breakfast, easy brunch recipe, or on-the-go snack! 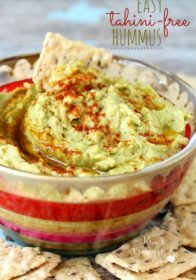 They are perfectly sweet, supremely moist and a springtime favorite. This post was originally published on 5/15/2015. 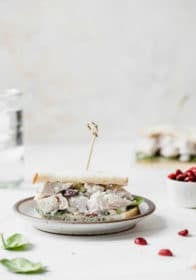 It was republished on 4/4/19 with helpful recipe tips and new photos. I’ve been craving strawberries like nobody’s business lately. Strawberries can be hit or miss this time of year and knock on wood, I’ve been hitting the jackpot in the strawberry department. Bright, cheery, sweet and juicy! 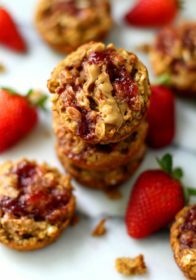 I loaded these strawberry banana muffins with diced fresh strawberries and sweetened them with mashed bananas and honey. Let’s talk about the oat streusel topping – it’s optional, but definitely recommended. 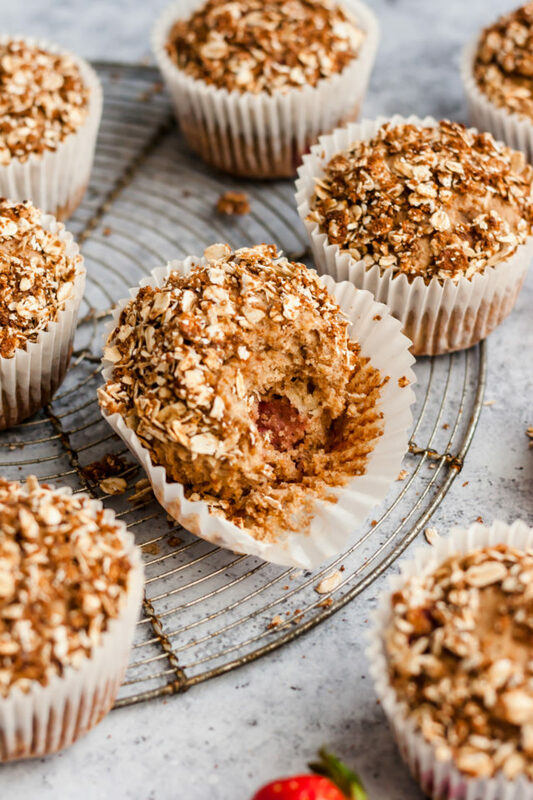 The muffins are fabulous without the streusel, but with the streusel added they’re really something to celebrate! I added just enough coconut oil to keep these muffins light, but also give them a lovely richness. The bananas and honey not only naturally sweeten the muffins, but also create a moistness that will have you begging for more. I’ve had to really exercise the willpower around these babies! Honey is my go-to for naturally sweetening baked goods. In combination with the extra ripe bananas, 1/4 cup honey was plenty to give these muffins a delightfully sweet, but not too sweet flavor. A perfect breakfast or anytime muffin! Like any muffin recipe, make sure that your ingredients are at room temperature before getting started. This helps everything mix together evenly without over mixing. Measure the flour correctly. Too much flour leads to dry, crumbly muffins. Whisk the flour first, then spoon it into a dry measuring cup and level off the top. Don’t over mix the batter. Gently fold in the dry ingredients using a wooden spoon or rubber spatula. Mixing the batter too much causes the muffin to be tough. Fill the muffin papers to the very top. This helps your muffins have perfectly domed tops. You can use frozen berries, but I prefer fresh berries when they’re in season. However, for frozen berries, make sure not to thaw them first. Then chop them into small pieces and toss with 2 tsp of flour to help prevent the color bleeding. These muffins are soft, moist, and packed with deliciousness. And SO versatile! You may use whole wheat flour or all-purpose flour, instead of the whole grain spelt flour that I used. And feel free to switch up the add-ins. These would be wonderful guilt-free blueberry banana muffins. Or throw in some chocolate chips. Maybe pecans and peaches? My mind is swirling with spin-off ideas! Whole grain muffins filled with juicy strawberries and covered with a sweet oat streusel topping! These muffins are a MUST make! Preheat oven to 350ºF. Line muffin pans with paper liners or coat with cooking spray. Set aside. In a large bowl, whisk together flour, cinnamon, baking powder and salt. Set aside. In a small bowl, whisk together eggs, honey, coconut oil and mashed bananas. Pour the liquid mixture over the dry ingredients and stir until flour disappears. Do not over stir. Gently fold in the diced strawberries. 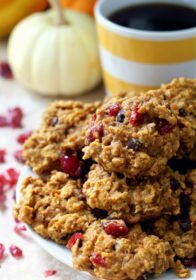 In a small bowl, combine oats, flour, sugar, and cinnamon. Mix in honey. It may help to use your fingers to stir and mix until combined. Fill 12 muffin cups evenly and close to full. 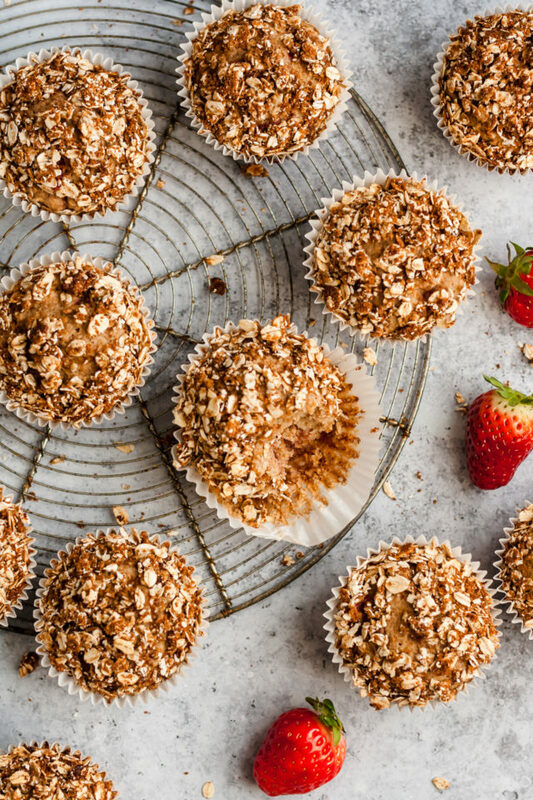 Sprinkle each muffin with oat streusel topping. Slightly press streusel into muffin. Bake for about 20 minutes or until a toothpick stuck in the middle comes out clean. Let cool for 5 minutes. Enjoy! *It's helpful to use eggs that are at room temperature, so coconut oil doesn't harden. If you forget like me, just add coconut oil to liquid ingredients last and then quickly stir liquid ingredients into dry ingredients. What I wouldn’t give for one of these muffins right now! 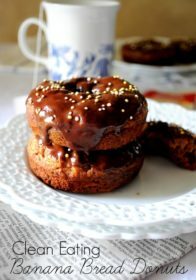 They look super delicious and look like the perfect treat to accompany alongside a good cup of tea. Mmmm these muffins looks absolutely scrumptious! The perfect healthy muffin i’ve been looking for. 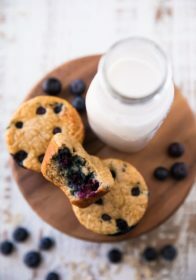 I love snacking through out the day on unhealthy things, and now it’s time to switch to these muffins! 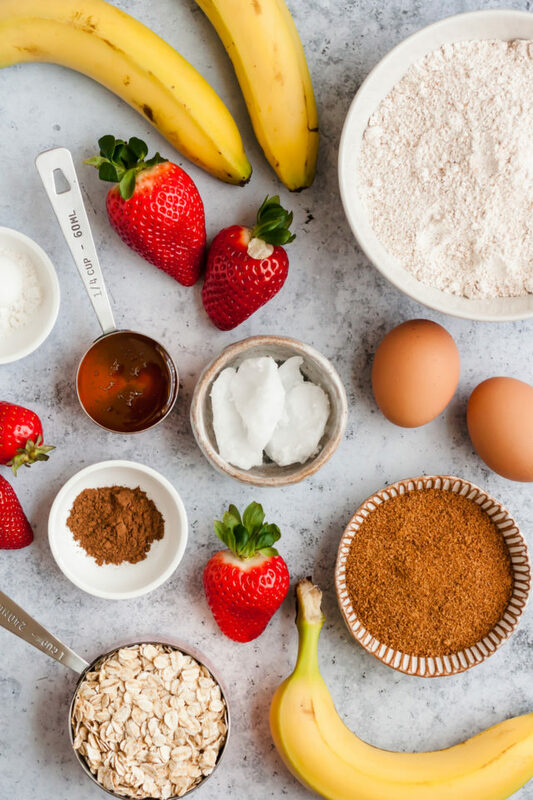 These strawberry banana muffins look delicious and my girls will love eating these for breakfast. I’m always looking for new things for them to try for breakfast. What a great idea to make a streusel topping! It’s like an added bonus on top of an already yummy muffin. They look fantastic! oh my these sound just delicious. that struesel topping just has me drooling. what an awesome muffin recipe! These are the perfect muffins to start the day. I love the oat streusal topping! Love this flavor combination. 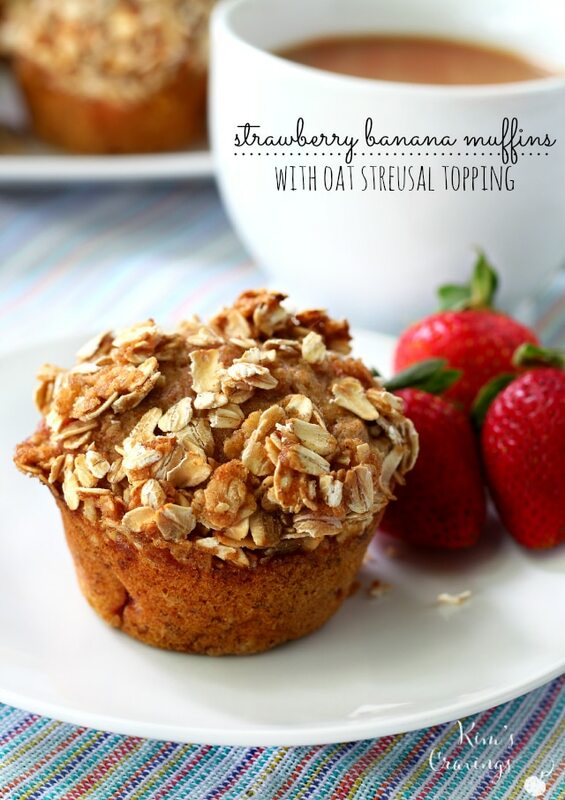 I am all about streusel on a muffin! I’m loving the idea of a delicious whole grain muffin. And that streusel topping looks so perfect! I’m definitely making these STAT! Thanks for sharing, Kim! Oh my goodness, these look amazing!! 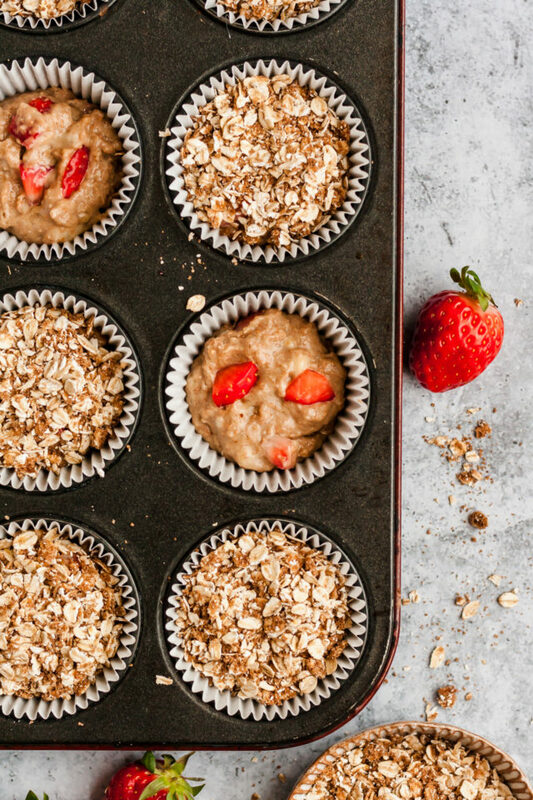 Strawberries are my absolute favourite and I love making muffins to grab for breakfast, with the addition of banana and that gorgeous topping I’m completely sold on these and NEED to make them! !